This is the first of what I hope will be many reviews of Amiibos and other Nintendo Figures. For Amiibos, I decided to review as many different aspects of the figure as I can to help you decide if the Amiibo is worth purchasing or if you already have it, some cool features you may not have noticed. 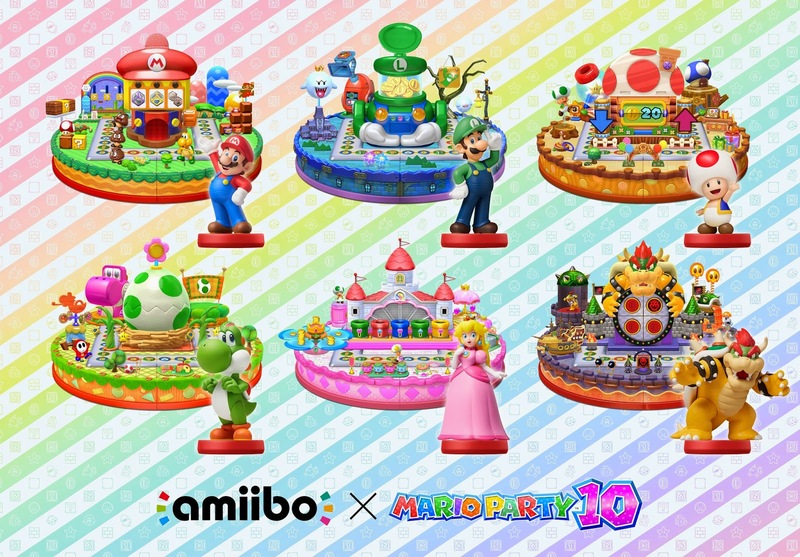 Background – Way back before Mario Party 10, the Super Mario line of Amiibos was announced by Nintendo to help support the Wii U game. Reaction was mixed among Amiibo fans because five of the six Amiibos were repeats of previous characters like Mario, Luigi, and Bowser. Toad was the only new character which made people that much more excited for Toad’s Amiibo. Rarity – Before his release, most people believed Toad would be rare because he was clearly the most sought after in the Super Mario line of figures. Preorders for Toad sold out long before any of the Super Mario Amiibos, but other than shortly after his release, Toad has not been too hard to find. At the time of writing, Toad is easy to find at the Toys R Us and Best Buy near me and is generally considered a common Amiibo. Worst Detail on Amiibo – There is only one area that might have been better on Toad and that is the base. The red base is fine and makes him stand out from other Amiibos, but the plastic piece on top is supposed to be a block pattern like in Super Mario Bros. 3 but uses two shiny gray tones that are hard to tell apart. They also cannot easily be seen unless you’re in direct light. This makes the base look like a plain gray when it could have been more striking. This is a small complaint, but certainly an area of the Amiibo that could have been stronger. Best Details on Amiibo – Toad is a simple figure and there wasn’t a lot of opportunities for Nintendo to either wow us. The red dots on Toad’s head are slightly raised and have a nice bright red paint. Toad’s mouth also has the right colors and the shadows are perfectly done. One of the only details you might notice is that he has a few wrinkles around the top of his pants which look nice and give it some texture. Flaws/Problems to Look Out For – The Toad Amiibo seems to be well made by Nintendo and few defects have been reported. Other than something blatantly obvious like his head being knocked off or something along those lines, you should have no problem finding a great Toad Amiibo online or in-store. There could be some “flash” or extra plastic in between his thumb and index finger on his left hand. This can easily be removed with a hobby knife or ignored depending on your preference. Even in a photo meant to show off the base, it is still hard to see the gray blocks. Reasons to Keep Toad Amiibo Unopened – All of the Super Mario Amiibos have excellent box designs and Toad is no exception. The silver and blue cross hatching and white background make this package really stand out and capture Toad’s cheerfulness. Toad is noticeably smaller than other Amiibos which helps offset his cuteness. Other than a really nice box design, there really isn’t any reason to shy away from opening him since he is a common Amiibo. 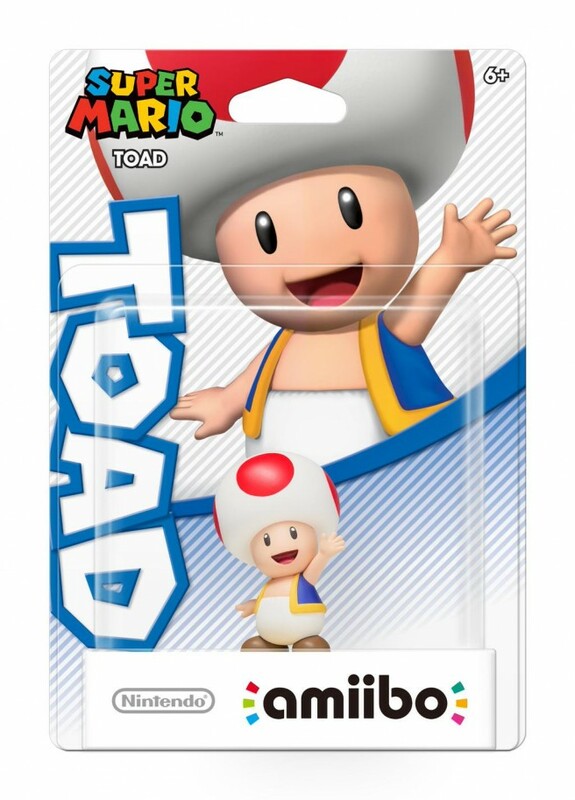 Reasons to Open Toad Amiibo – First, he is cheap and readily available so you won’t lose a lot (or possibly any) value by opening him. 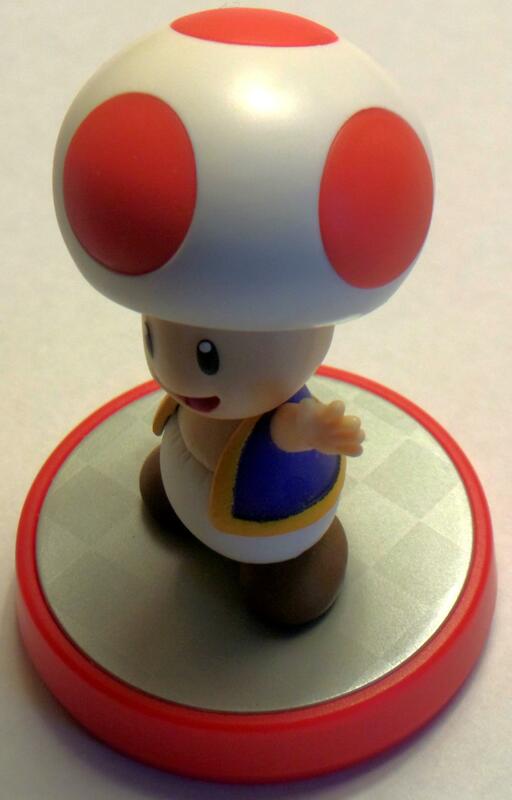 Toad is also the only Amiibo which has interesting functionality with Captain Toad: Treasure Tracker. He unlocks an extra mode where you search for a hidden “Pixel Toad” in most of the game’s level. Some of these are really easy and others are a good challenge. If you play Captain Toad then you probably want this Amiibo because it adds a fun mode and lets you get extra value out of what is a fairly short game. Toad also has functionality in Mario Party 10 and can be your game piece. Toad is also one of the few eligible Amiibos for Party Mode. He will also be in Super Mario Maker and Yoshi’s Wooly World so Toad is fairly versatile and won’t just sit around being displayed. Toad has higher than average functionality in Captain Toad Treasure Tracker and Mario Party 10. Final Thoughts – Toad is a pretty simple Amiibo, but Nintendo definitely got him right. He is cute and charming and has pretty good value if you want to actually use the Amiibo. There is no doubt that Toad is the highlight of the Super Mario line. Previous What is World of Nintendo Micro Land and Why Am I Collecting It?